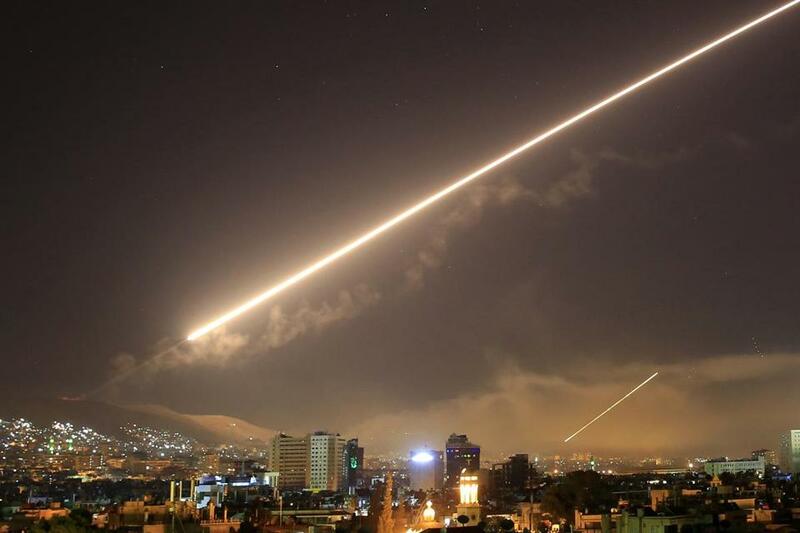 Damascus skies erupted with surface to air missiles as the US launched an attack on Syria. WASHINGTON — The United States, France and Britain launched military strikes in Syria to punish President Bashar Assad for an apparent chemical attack against civilians and to deter him from doing it again, but also stirred up angry responses from Syria’s allies and ignited a debate over whether the attacks were justified. She also called on Russia to ‘‘honor its commitment’’ to ensure the Assad regime gives up chemical weapons. President Trump addressed the nation Friday night regarding strikes on Syria. Here are his full remarks. The Syria attack drew support from the European Union, Germany, Israel and other allies while British Prime Minister Theresa May said reports indicate the Syrian government used a barrel bomb to deliver the chemicals used in an attack on Douma. She said the use of force was ‘‘right and legal’’ in this case. Mattis said the assault was a ‘‘one-time shot,’’ so long as Assad does not repeat his use of chemical weapons. The strikes were carried out by manned aircraft and from ships that launched cruise missiles from the Mediterranean Sea. Mattis disclosed that the U.S. had not yet confirmed that the most recent suspected Syrian chemical weapons attack, on April 7 in the Damascus suburb of Douma, included the use of sarin gas. He said at least one chemical was used — chlorine, which also has legitimate industrial uses and had not previously triggered a U.S. military response. ‘‘This is difficult to do in a situation like this,’’ he said, in light of the volatility of chemical agents. Gen. Joseph Dunford, chairman of the Joint Chiefs of Staff, said the U.S. did not coordinate targets with or notify the Russian government of the strikes, beyond normal airspace ‘‘de-confliction’’ communications. But the description from an ally described things differently. British leader May said in London that the West had tried ‘‘every possible’’ diplomatic means to stop Assad from using chemical weapons. ‘‘But our efforts have been repeatedly thwarted’’ by Syria and Russia, she said. Mattis estimated the latest air campaign was about twice the size of the 2017 strike. He added that the U.S. expects the Syrian government and its allies to conduct a ‘‘significant disinformation campaign,’’ which the Pentagon would rebut with additional information Saturday morning. 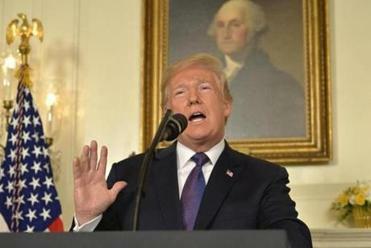 Trump chastised Syria’s two main allies, Russia and Iran, for their roles in supporting ‘‘murderous dictators,’’ and noted that Russian President Vladimir Putin had guaranteed a 2013 international agreement for Assad to get rid of all of his chemical weapons. He called on Moscow to change course and join the West in seeking a more responsible regime in Damascus.